IFC Area: South side of Pennsylvania Road West of Fort Street. 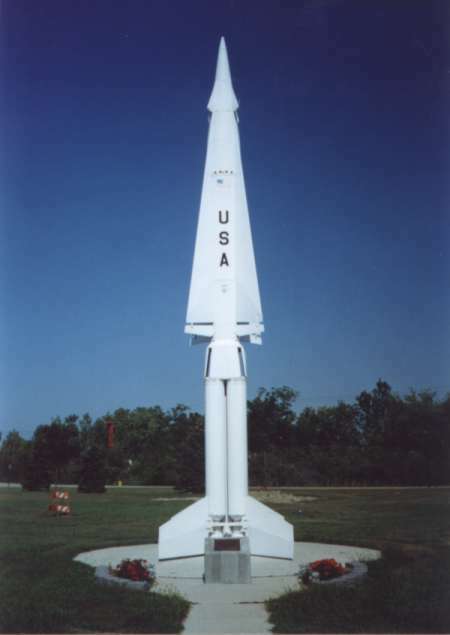 GPS: +42° 10' 59", -83° 11' 47"
Launch Area: North side of Sibley Road west of Fort Street. GPS: +42° 10' 28", -83° 11' 40"
Current Status: Launcher area is now a public park with a Nike-Hercules missile and plaque dedicating the site. 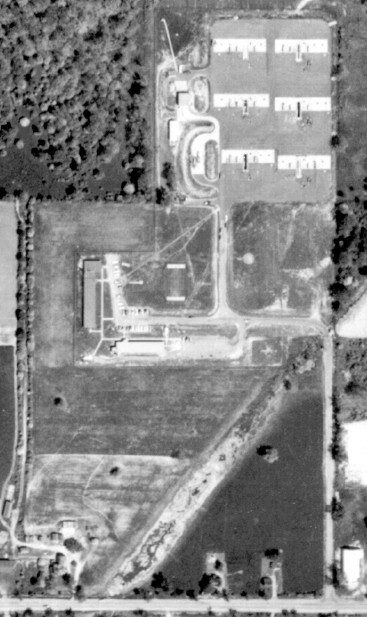 The pits are still there, under the socccer field, behind the fire station. They were capped with concrete and covered with ash and slag from Great Lakes Steel and then dirt. It is now a soccer field. There is some concern that there may be some contamination from either the fill or the pits. The Corps of Engineers suggested the site for remedial action but due to the fill, it was rejected. Now the City has to determine if it's the fill that is contaminated or not before any other action can be carried out. Comments: This was a Double Site. D-54 as it appeared in 1961. 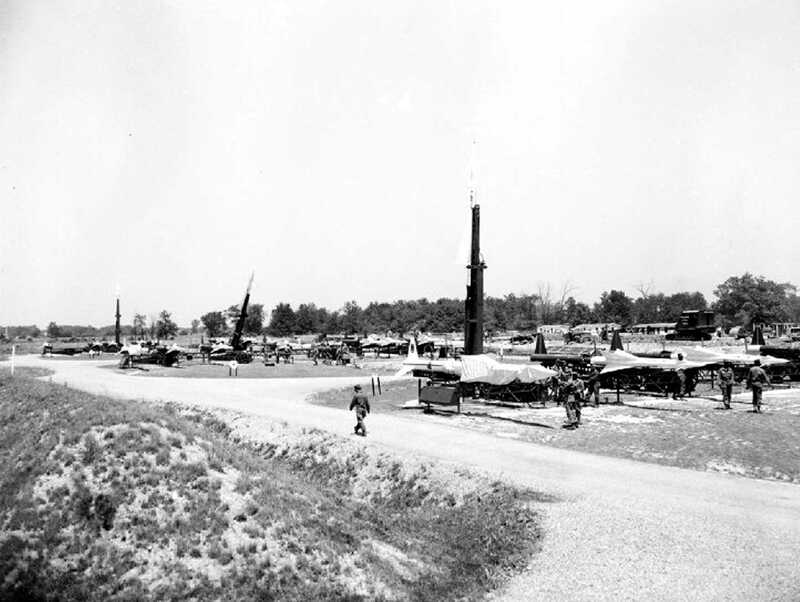 D-54 Launcher area as it appeared in 1961. D-54 IFC Area as it appeared in 1961. © Walter P. Reuther Library, Wayne State University. All rights, including those of further reproduction and/or publication, are reserved in full by the Walter P. Reuther Library, Wayne State University. Under no circumstances can the user distribute the image(s). All image inquiries are to be forwarded to the Walter P. Reuther Library's Audiovisual Department. Photographic reproductions may be protected by U.S. copyright law (U.S. Title 17). The user is fully responsible for copyright infringement. This "Monument" has been placed at the former Launcher Area of D-54. It is ironic that a Hercules is here as this site was never converted from Ajax. 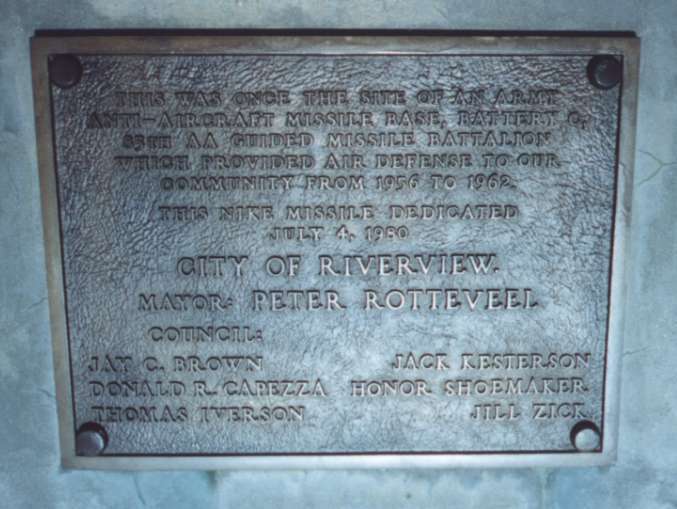 This is the plaque at the base of the missile. The former Nike control area is known as the Rivergate Nursing Home and Terrace. The former launch area is currently a park owned by the City of Riverview. 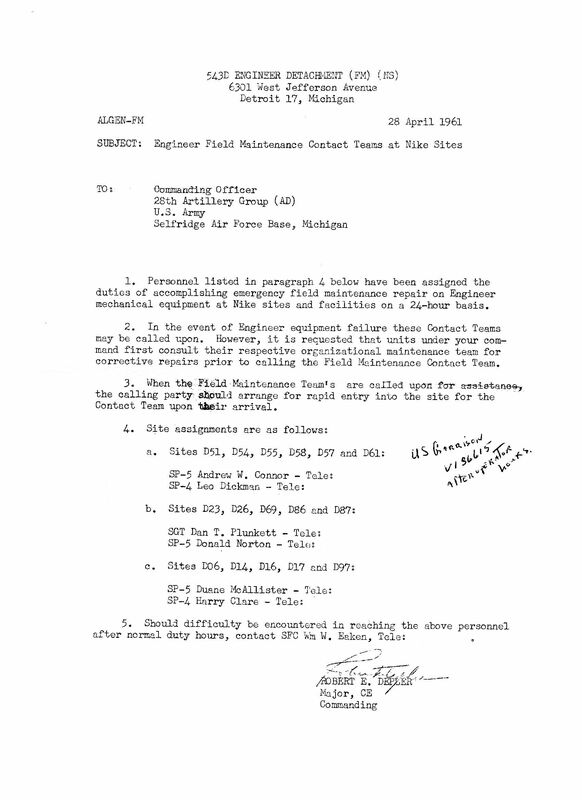 DoD acquired 82.84 acres 1956. 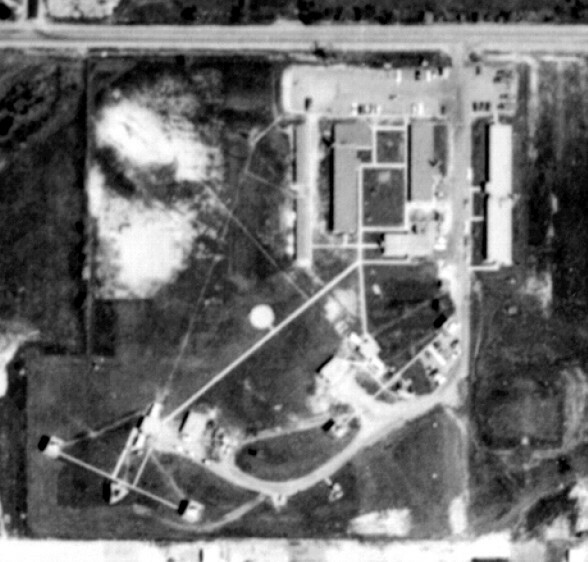 Of the buildings associated with the former DOD installation, only the southern barracks building and six missile silos remain. The barracks building has been converted by the City of Riverview to a senior citizens activity center. The underground missile silos remain below the surface of the former launch area. On 1 Aug 63, DOD reported 75.54 acres as excess and by 1973 the remaining acreage was excessed. I grew up right next to the IFC. My back yard bordered the property and my school was next to the Launcher Area. The IFC was on Pennsylvania Rd 1/4 mile west of Fort St. The property was cleared in the late 70s and an old folks home is now on the site. As kids we used to hang out in the buildings. The Launcher Area was on Sibley Rd 1/4 mile west of Fort St. That property now has a Library, Fire Station and Park on it. There is one original building left on the property that the city has refurbed and uses as a hall for Cub Scout events and things like that. When we were kids all the building were there as were the launchers and equipment. It was opened with nothing to stop you from going in. We pulled the air vent covers off and climbed down into the underground world. There were hallways and rooms full of equipment and usually about 1-2 feet of water. When I was about 12 years old one of my friends got electrocuted and died down there. That year, they opened up the big steel doors and filled all the underground with cement. They then demolished all the buildings and buried it under 3 feet of dirt. This page was last updated on 03/10/2014 .